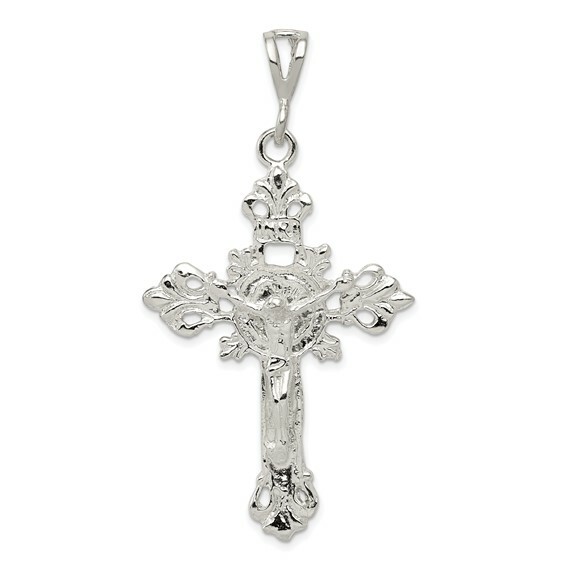 This large diamond-cut crucifix pendant is made of polished sterling silver. Item size: 1 3/4 inch tall by 1 1/4 inch wide without bail. Made in the USA. Weight: 4.8 grams. Chain not included. Crosses with a representation of the body of Christ, or corpus, are crucifixes and recall the death and resurrection of Christ. A pleasure to deal with, fast shipping , would buy do business with any time. I baught this crucifix for myself and I wear it everyday, It goes with everything and I love it! I would recommend Joy Jewelers to everyone, They sell quality merchendise.